Why you should watch it: This documentary, from 2014, is short and to the point. Clocking in at an hour and six minutes, it won’t take much time at all to enjoy. If you are like me, you grew up gaming... and handsome. But anyway, I am a part of the original gaming generation. I spent my free time at arcades around town, and I had the original Atari 2600 in my early youth. I’ve written about the resurgence of the arcades and I’ve reviewed a video game documentary before. I still play video games to this day. I still get a thrill out of it. You would also like this doc if you ever saw E.T. - The Extraterrestrial. Face it, there aren’t that many people who haven’t seen it. The tremendous global entertainment impact of this 1982 film sent merchandisers scrambling to slap E.T.’s face on any and everything. Unfortunately, this included Atari, which was at the time the largest, most successful home arcade giant in the industry. Atari rushed it, not giving enough time to develop a good, quality game, and instead focused on meeting a deadline and making money hand over fist. They failed miserably. The game is referred to as The Worst Video Game of All Time. After some time and public backlash, the game simply vanished. This documentary tries to verify or debunk the urban legend that Atari simply dumped millions of game cartridges beneath the ground forever. It’s hard to believe a large, money-driven company even considering dumping their losses, but the rumors persisted. The interviewed subjects are interested fans, people who created the game, Atari bigwigs, and local town mayoral candidates. The whole idea of this particular documentary seems absurd, but it’s so incredibly engaging that you can’t stop watching it. Ernest Cline is also interviewed in the documentary. He is the author of a tremendously entertaining book, focusing heavily on video games and 80s nostalgia, called Ready Player One. I suggest you read it if you haven’t already. It’s outstanding. As I mentioned earlier, the film doesn’t take up that much of your time. If you have nothing much to do, or you’re killing an hour or so before heading out this evening, I suggest checking it out. The trailer for the doc is informative without really spoiling any secrets. 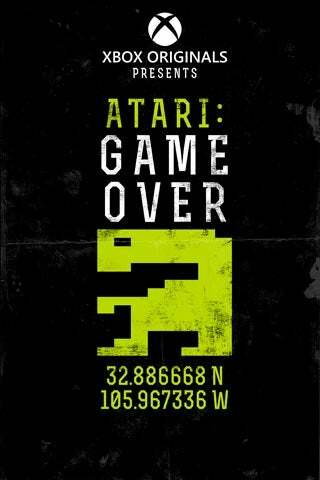 Atari: Game Over can be found on Netflix, YouTube, and streaming (I’m pretty sure) on Xbox Live.